The hugely successful Transporter franchise spawned three hit movies and a TV series and it’s not done yet. Sure to be an action-packed reboot, 'The Transporter Refueled' takes us and Frank Martin– the iconic character created by Luc Besson ('Transporter' franchise, 'Lucy', 'Taken' franchise) – back to where it all started. In this fast-paced prequel, Ed Skrein (fresh from making heads roll in TV’s Game of Thrones) plays the younger Frank, a mercenary driver who specialises in moving goods of all kinds. This time he must apply his unique skills to the task of taking down Russian human traffickers who have kidnapped his father. The 'The Transporter Refueled' competition has now closed. Winners will be announced shortly. Competition opens at 7pm AEST on Wednesday 26th August 2015 and closes at 11:59pm AEST on Thursday 3rd September 2015. Five winners will be chosen at random on Friday 4th September 2015. To successfully win, entrants must fulfil the above entry conditions before the time the competition closes. Current members/followers are eligible to enter the competition. Only one entry per person. Only one winner per household. To be a valid winner, the entrant must not have won a prize from SWITCH within the last 28 days. 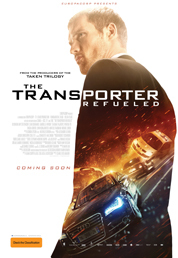 Each winner will receive one double pass to 'The Transporter Refueled'. By entering, you agree to receive occasional emails from SWITCH in the future. If you decide to unsubscribe from these updates, any further entries will not be applicable. Only Australian residents are eligible to enter. 'The Transporter Refueled' is in cinemas from Thursday the 3rd September 2015 through Icon.